When was the last time you patted yourself on the back for surviving a family trip with no one succumbing to dysentery or cholera? Like many people who grew up in the grey area between Generations X and Y, I have fond memories of playing that endearingly low-tech computer game known as “The Oregon Trail” on my best friend’s Apple II. I remember the thrill of surviving the trail in my green pixelated wagon without having to write my own epitaph (the usual outcome). To my great joy, my 8-year-old son is at an age where he can appreciate the game, too, and its historical underpinnings. “This is a lot more intense than I realized, Mommy!” he said while hunting for our OT party’s next meal. In 2018, as the real Oregon Trail celebrates its 175th anniversary, I wanted to take my family to experience a portion of that chapter of U.S. history, learning about the Great Migration up close. The Oregon Trail officially begins in Independence, Missouri, snaking through Nebraska, Wyoming and Idaho, and ending in Oregon City, Oregon. Some of the museums are offering special seminars and events to celebrate the anniversary throughout the year. We focused our trip on the Mt. Hood Territory, which includes some of the most treacherous terrain leading to the trail’s official end point in Oregon City. After flying into Portland, we gathered our strength for the journey ahead by staying at a HomeAway rental, a cozy blue house with a wild backyard in the Alberta Arts District, conveniently located within walking distance of several trendy brunch spots. Why rough it, right? There we would make some tough decisions when stocking up on provisions from the General Store known as “Walgreen’s”: diet soda, juice boxes and cereal bars. No yokes or wagon axles in sight, we trudged on. I asked my 8-year-old to imagine the amount of clothing, food and medicine we’d need to take on the journey if we were living in the 1840s, while abandoning unnecessary weight from home, like toys. He balked at the idea. 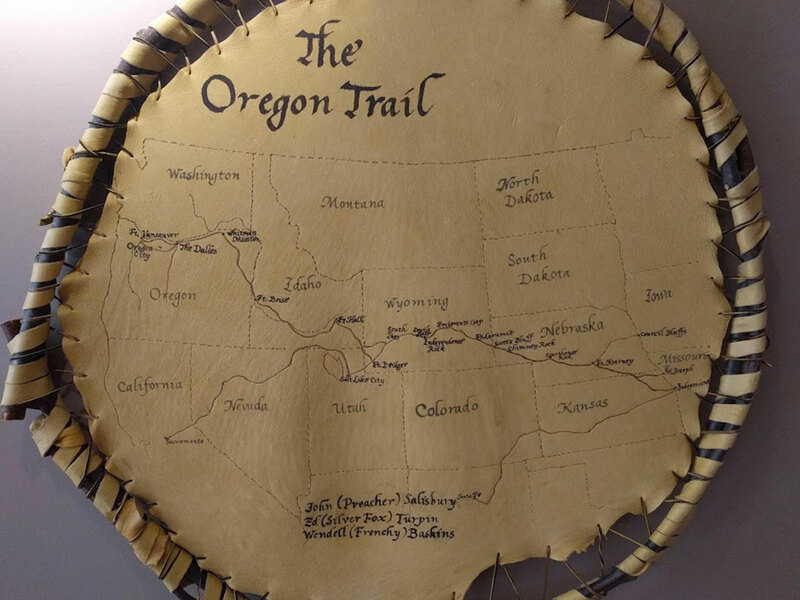 The Real Oregon Trail Experience: A visit to the End of the Oregon Trail Interpretive Center in Oregon City informed us about how carefully families would plan their supplies for the six-month journey west. The first exhibit in the museum shows how small the wagons actually were, and how they were generally used only to transport supplies (up to 2,000 pounds for a family of four). Most people, and even children, walked the 2,000-mile Oregon Trail, sometimes barefoot. We didn’t encounter a single ox throughout our journey on the Oregon Trail-but we did meet a few other animals in this richly agricultural region. In Canby, Oregon, we met with owners Todd and Tessa Koch of TMK Creamery, whose cows seemed really happy lounging in the shade of their barn with fans cooling them off on a hot summer day. TMK Creamery produces a rich, single-cow cheddar cheese and they soon plan to make ice cream, too. About 10 miles south, we petted some sweet-faced alpacas at the Marquam Hill Ranch. Owner Jennifer Cameron dazzled us with alpaca knowledge, letting our boys feed and walk them around in her barn. Alas, the alpacas weren’t suitable trail animals — though the dense alpaca wool would have come in handy during cooler days on the Oregon Trail — but we were happy to have met them on our journey. The Real Oregon Trail Experience: Speaking of cows, occasionally families would bring cows along with them for milk or meat, and kids on the Oregon Trail had the uncelebrated job of collecting cow chips (or buffalo chips) to burn for campfires along the journey. There are even records of a game they used to play called “Ante, Ante Over,” where they’d toss the buffalo chips from one side of the wagon to the other. Luckily, we never had to change our rations to “meager” or “bare bones,” per game settings. Our meals were nearly always large and generous, and there were some great snacks along the way, too. To my great delight, all along the belly-tickling hills of the Mt. Hood Territory, we found new-to-us berries and happily stocked our wagon (aka a rental Mazda 6). “Marionberries!” I announced one afternoon, steering our wagon down a dirt road adorned with “U Pick” signs. My husband chatted with the proprietor while my boys and I grabbed a bucket and picked. “On the house,” the man told us, waving us away with our tart berry treasure, and we drove away happily nibbling. Another day, we picked baskets of ripe raspberries and blueberries at Our Table Cooperative in Sherwood, where we also enjoyed a lovely Farm Friday dinner with pints of local beer and wood-fired pizzas (such great provisions!). Climbing the Mt. Hood Scenic Byway to Timberline Lodge (elevation: 6,000 feet) was another thrill that came with amazing views from Mt. Hood and a delicious lunch buffet filled with Oregonian cuisine (and more marionberries-this time, atop pork medallions). My oldest son also begged to stop in at Tony’s Fish Market in Oregon City, trying to convince me to buy one of the fat, glassy-eyed steelhead trout in the case. “We have nothing to cook that on!” I told him. Oregon Trail-mother fail. We did sample some salmon candy, which was surprisingly good. The Real Oregon Trail Experience: By most accounts, the OG OT travelers subsisted on pretty boring food selected for its unlikeliness to spoil, like beans, oats and dried beef. They also hunted along the way, supplementing their meals with wild game and fish, plus anything they might trade for with Native Americans. I also like to think they got as excited as I was to see those marionberries. In the computer version of the Oregon Trail, when given the choice of crossing a river, any player worth one’s salt would happily caulk up the wagon and float it across the river. Our own river crossing was not without drama, however. We loaded up our rental electric boat from the Willamette Falls Electric Boat Company with our family, plus some local friends we met up with, and I steered us away from the dock toward Willamette Falls at a top speed of 6 mph. With much speedier boats zipping past us and leaving us in a sizable wake, the thought crossed my mind once or twice that we might capsize. Nevertheless, I plastered a confident grin on my face and we stayed upright, enjoying some Bob Marley tunes on the sound system (to wit: “Don’t Rock My Boat”). We snapped some pics in front of the thundering falls, which are second only to Niagara Falls by volume and home of wild salmon and lamprey. The Real Oregon Trail Experience: In reality, the choice — or necessity — to take the river instead of the land route was fraught with peril for Oregon Trail travelers. Until the Barlow Road opened (which charged a hefty toll that not everyone could afford), the emigrants had no choice but to raft down the Columbia River from The Dalles to Fort Vancouver and then on to Willamette Falls. Nowadays, man-made locks have calmed the waters, but two centuries ago, treacherous rapids combined with makeshift wagon-boats meant that many would have perished close to their final destination. The Mt. Hood Territory is home of some spectacular spots to rest a spell. In the Oregon Trail days, this was called “nooning.” It’s easy to imagine how breathtaking the scenery might have been to the weary overland traveler upon arrival here, after surviving months of snake bites, robbers and communicable disease, not to mention the constant “Are we there yet?” whine from the kids. We particularly enjoyed our stay at the Mt. Hood Oregon Resort, our room’s balcony perched in the woods, overlooking the sparkling swimming pool, plus onsite restaurants, a 27-hole golf course and luxury spa. If we were exhausted from our “grueling pace,” this was definitely the remedy. Another night, we stayed at one of the tiny houses in Mt. Hood Tiny House Village, part of a larger campground with a variety of accommodation options, plus amenities such as a swimming pool, hiking trails and a fabulous restaurant. Our tiny house had two loft areas with queen-sized beds, a smaller bed on the main floor, a kitchen, bathroom and mini sitting area. Our kids loved staying in a house just their size, with a fire pit outside for marshmallow roasting and plenty of nature to explore. One of the most sobering and fascinating parts of our trip was our hike on the Barlow Road — by all accounts the most difficult stretch of land that travelers on the Oregon Trail had to navigate due to its steep elevation. Here we hiked about 2 miles, from Pioneer Woman’s Grave to the Barlow Toll Road marker and back, eyes peeled for signs of wagon ruts and rope marks on trees (which you can occasionally spot even today throughout the 2,000 mile trail). Emigrants would actually tie their wagons to the trees here, using leverage to help lower the back-breaking weight into the steep ravine below. I couldn’t stop thinking about the effort that would have required, particularly as my 3-year-old piped up about how tired his legs were. Pioneer Woman’s Grave was another somber sight: a simple stone marker dedicated to an unknown woman who had perished along the trail in the 1840s and was buried in a wooden wagon box here — one of many heartbreaks. The Real Oregon Trail Experience: Of approximately half a million travelers on the Oregon Trail, an estimated 10 percent died due to a variety of causes — most from disease from poor sanitation and bad drinking water along the route. The next most likely cause of death was due to accidents from mishandled wagons and calamities from the treacherous terrain. Reaching the Willamette Valley would have been cause for celebration in the 1800s. But after their free land claims were in hand (640 acres for each married couple), the emigrants would have gone to work immediately on their new land. We learned about what those homesteads might have looked like at the historic Philip Foster Farm in Eagle Creek. Philip Foster, one of the earliest settlers during the Great Migration, traveled by ship to Oregon from Maine in 1843. In partnership with Sam Barlow, Foster became the toll collector at the end of the famous Barlow Road, and also set up shop as a general store proprietor and postmaster. The historic farm allows visitors to try frontier chores like sawing wood, lifting bales of hay, grinding corn and washing clothes. Then, we abandoned our chores and chose to have a bit more fun, spending a day ziplining, racing, and alpine sliding at Mt. Hood Adventure Park at Skibowl, a summer fun park with more than 20 rides spread out across two separate areas in Government Camp. Bottom line: The Oregon Trail was a brutal journey 175 years ago… slightly more fun when it was remade into a game, and miles better in person in 2018. Can’t Wait to Hitch up Your Wagon? The Mt. Hood Territory has a resource rich website with information about the historic anniversary throughout the trail. You can visit the National Park Service website with an interactive trip planner. There’s also an app with self-guided tours and other information.